"A bright and colorful salad just in time for spring! Use with or without egg for vegan. Feel free to top with chicken as it works wonderfully too! 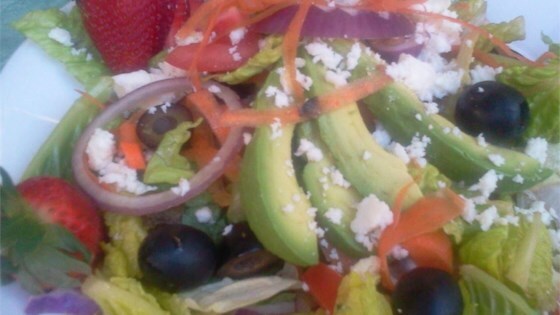 Serve drizzled with your choice of dressing." Combine spinach and lettuce in the bottom of a large salad bowl. Top with strawberries, mushrooms, avocado, black olives, hard-boiled eggs, red bell pepper, yellow bell pepper, orange bell pepper, broccoli, and cauliflower. A colorful, crunchy salad loaded with good stuff like avocados, grapes, and nuts. Usually this is my Random Salad with no real actual measurements, I quite like just throwing stuff together, but for recipe's sake I'm writing it up. I put 1/4 cup of bell peppers. Really I just use a 1/4 of the pepper, I'm not so concerned with exact measurements on this one. I like to have the spinach/lettuce on the bottom, then arrange the rest in piles around the rim of the bowl. It really displays the colors. The picture displayed doesn't have all the ingredients, but it has many to give you an idea of how pretty it turns out. This salad is quite colorful and goes with just about any dressing!